Sue Moores is changing kids’ ideas about fresh food — and themselves — with her unique nonprofit organization. It can be fun to look back on a person’s life and see how each step led to another, and how the intersections of interests and opportunities might have created the life that person is leading now. For Sue Moores, age 59, there have been recurring themes — a love of baseball, an appreciation for delicious food, a desire to give back to the community and a concern about the national viewpoint on nutrition, especially among young people. Mix all those themes together, toss gently and voila! — you arrive at a life’s purpose that’s as vibrant and satisfying as a freshly made garden salad. As it turns out, Moores knows a thing or two about the art of salad making — and also about community-building, youth development, entrepreneurship and volunteerism. As the founder and executive director of nonprofit Roots for the Home Team, she works with Twin Cities’ youth in local community gardens, helping them dream up tasty salad recipes for the fresh produce they grow. The young gardener-chefs become budding entrepreneurs when they sell those delicious salads — with names like Mediterranean East Side, Kickin’ It Filipino, Lakota Wojapi Manoomin and Purple Rain — at Minnesota Twins’ games at Target Field. Last year, kids in the program grew 580 pounds of organic vegetables and sold 700 salads. How did Moores — whose day job includes working with Kowalski’s Markets as a nutritionist — come to be heading up the nation’s only youth entrepreneurial salad business in a major sports venue? It’s the brainchild of her lived experience and her observations of our local landscape, especially as it relates to food. Her two thoughts — getting young people interested in trying fresh, nutritious food at the same time our baseball team was getting a fresh start in a new location — came together in Moores’ mind, and Roots for the Home Team was born. Now all Moores had to do was establish a brand-new nonprofit, arrange partnerships with youth-focused community gardens, find corporate sponsors and convince the Twins to welcome her project at Target Field. If that seems like an absurdly difficult and dauntingly complex task — too much for a mere mortal — then you haven’t met Sue Moores, who has enough energy and optimism to field a nine-person team all on her own. Moores began reaching out to members of the Twins’ organization — and reaching, and reaching and reaching. “I was an unknown entity, pitching a never-been-done-before idea,” she said. Finally, in May 2012, an agreement was in place, and Roots youth sold their first salads during a weekend home game. 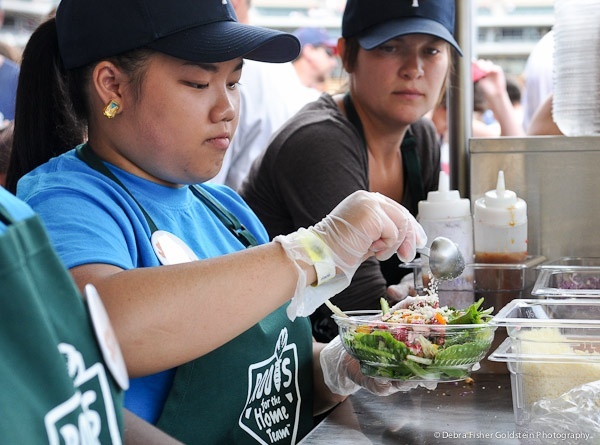 Moores remains deeply grateful to the Twins for allowing her to sell locally grown salads alongside the stadium’s other food vendors. Dave St. Peter, the Minnesota Twins’ president and CEO, describes Moores as one of the most persistent people he’s ever met. In addition to the Twins ball club and the team’s Community Fund, the organization also receives support from Land O’ Lakes, Just Bare Chicken, Blue Cross Blue Shield of Minnesota, Deluxe Corporation, the Richard M. Schulze Family Foundation, Kowalski’s Markets and Apple Autos. Moores has also expanded the program beyond the stadium. Roots salads are also sold seasonally in area Kowalski’s Markets, Breaking Bread Cafe in Minneapolis and at some Minneapolis Public Schools. Learning a bit more about Moores’ background offers some clues about her ability to combine nutritious eating and baseball games in such an original way. While growing up in the Chicago suburb of Highland Park, her father often took her to Cubs games. Unsure of what she wanted to do for an actual career, she let her mother direct her major. She earned a bachelor’s in nutrition and food science from Iowa State University and a master’s in nutrition from the University of Wisconsin–Stout. She was working a summer job at the Roseville Professional Center when she noticed a cute guy who kept walking by her office. “Finally he came in and asked me, ‘Are you as bored as you look?’ When I said yes, he took me out to lunch,” she said. That guy, Mark, is her husband of 34 years. The couple, longtime Mahtomedi residents, have three children — Jack, 30, who lives locally and works with his father in their insurance brokerage firm; Clare, 27, who lives in Denver and works in health care; and Eileen, 25, who lives in New York and works in the menswear industry. Now that her children are grown and launched, Moores maintains youthful energy and enthusiasm by spending time with the young people, ages 14 to 18, who participate in Roots for the Home Team through their community garden programs, including Appetite for Change, Dream of Wild Health, Urban Ventures and Urban Roots. Many of the young participants lack sufficient opportunities to fully explore career options, so Moores is excited about how culinary and entrepreneurial experiences can help them expand outside of their communities and discover their own potential. After the Twins’ home opener on April 5, Moores will be ramping up for her busy season. On May 19, salad sales will kick off at weekend home games. Does she ever get a chance to watch the game? Moores dreams of expanding her St. Paul-based Roots program locally and nationally. Her passion and conviction are an inspiration to many, including Nathan Sartain, a culinary arts instructor at St. Paul College. He opens his school’s kitchen every year for a Roots for the Home Team recipe-development day with area chefs. Moore looks forward to watching new kids come into the program, too. Look for the “Garden Goodies” cart with the bright orange carrot near Gate 34 (by the flagpole), beginning May 19 at Twins weekend home games. You can also buy Roots for the Home Team salads at Breaking Bread Café in Minneapolis and Kowalski’s Markets in the Twin Cities. Hoping to volunteer? Contact Roots about becoming a volunteer career ambassador. “We’re always looking for role models in food, business and sports to share an hour or a day to help our kids grow their appetite for vocational success,” Moores said. If you would like to donate goods or services, the organization’s in-kind wish list includes compostable bowls, lids, sample cups, forks and spoons; photography/videography; printing/screen printing; social media marketing and public relations. Julie Kendrick writes about food, nonprofits and other topics for local and national publications. Follow her @KendrickWorks on Twitter. What an amazing woman and organization! Thanks for all that you do for your community Sue!